Data on climate changes of the past 10,000 years are available from various parts of the world, but to make the test as favourable as possible for the man-made warming hypothesis, let’s go to the Arctic. That is where the computer models predict the strongest and most rapid warming, and where the media have publicized repeated claims that Greenland is melting away and the polar bears are drowning. 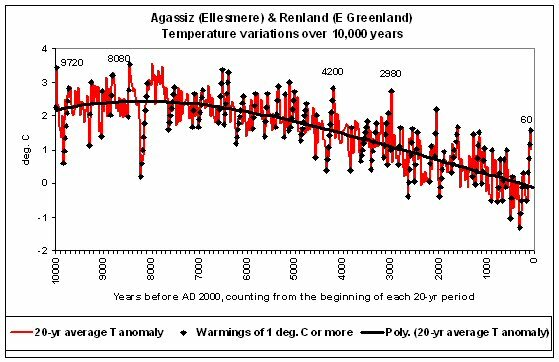 Below is a graph using a particularly careful reconstruction of Greenland temperatures during the past 10,000 years, by Bo Vinther of the Niels Bohr Institute in Copenhagen and his colleagues (2009). Ice drilled at the sites called Agassiz and Renland, 1500 km apart on either side of the Greenland ice sheet, provided the data. Anyone who suspects I may misrepresent the results is welcome to compare my graph with Fig. 2c in the 2009 Vinther paper. Temperature variations (red) are oxygen-18 data corrected by Vinther et al. 2009 for uplift of the bedrock and changes in the O-18 content of the ocean. Upward trending lines of black diamonds denote warmings of 1 deg. C or more, and the black trend line is a 4th-order polynomial. To explain the dating, 60 means the 20-year period starting 60 years before AD 2000, i.e. 1940-60, whilst 9720 for example means 7720-7700 BC. 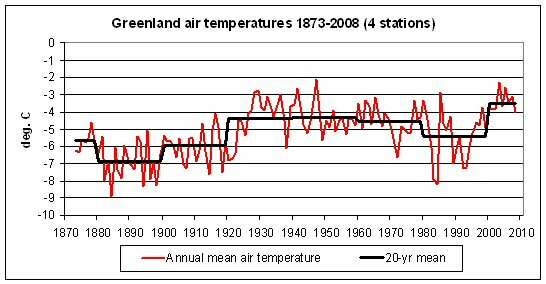 On this roller-coaster ride with the Greenland climate, the graph shows repeated plunges in temperature. Look at the big drop (whee!) after 8080 years ago, and most recently into the Little Ice Age 300 years ago – the coldest time since the last big ice age. But the climbs are what we’re interested in just now. I’ve picked out with the black diamonds all rises in temperature of more than 1 deg. C, to help in looking for ways in which the recent warming may have been out of the ordinary. Test 1: Unprecedented temperatures? Plainly not. In the overall plot, more than 50 peaks are higher than that of the 20th Century. But still wanting to make the test as favourable as possible for the man-made warming hypothesis I’ve added a trend line. It shows an 8000-yr decline in temperatures, attributable to the orbital change that has reduced the intensity of sunshine during the Northern Hemisphere summer. The two largest excursions above the trend line are 1.64 deg. C, 60 years ago (AD 1940-59), and 1.67 deg., 2980-2961 years ago. So although the 20th Century warming was striking in this respect, it was not unique, even according to this helpful way of testing it. Test failed. Test 2: An especially large recent rise? The combined increase in temperature, between 160-141 and 60-41 years ago (i.e. 1840-1959) was 2.07 deg. C. Three larger rises occurred, culminating 9720 years ago (2.21 deg. ), 8080 years ago (2.77 deg.) and 4200 years ago (2.44 deg.). Test failed. Test 3: An especially rapid recent rise? The 1840-1959 rate of warming was 0.21 deg. C per decade. For the three larger rises mentioned in Test 2, the rates were 0.18, 0.23 and 0.17 deg. per decade, all roughly equal to the recent warming rate. Among the many warmings of 1 deg. or more shown in the graph, 17 were slower, 4 were equal and 23 were faster than 1840-1959 – in some cases very much faster. The events culminating 5080, 2960, 860 and 540 years ago all surpassed 0.7 deg. per decade. Test failed. Test 4 : An accelerating rate of rise? The Agassiz-Renland series ends in 1960-80. The last two points in the graph show the 1940-60 peak at 1.56 deg., followed by a marked cooling to 1.01 deg. in 1960-79. (Not easy to see, but look for the little red tip below an earlier warming diamond). How do we find out what happened since 1980, when man-made warming was supposed to hit hard? Bo Vinther (2003) testifies to a good match between temperature variations at ice cap drilling sites and near the Greenland coast. The Danish Meteorological Institute maintains a long-term series of air temperature data for Upernavik, Ilulissat, Nuuk and Narsarsuaq. Here I average the annual data for those four coastal sites and show 20-year means, corresponding to the time steps in the Agassiz-Renland plot above. There are also stumps of less than 20 years, for 1873-79 and 2000-08. The rise in air temperature corresponding to the ice warming to its mid-century climax 1940-59 is evident, and so is the cooling that ensued 1960-79. What followed in 1980-99 was no accelerating rise but, on the contrary, a further fall in Greenland air temperatures – this during a period when CO2 in the air increased by 10%. Supporters of the man-made global warming hypothesis will be relieved to see the air temperatures perking up in 2000-08. Without being pedantic and saying we should wait till 2019 to see whether the relatively high temperatures are sustained, let’s take the increment of 1.94 deg. at face value and ask whether it represents a convincing “accelerating rate of rise”. It’s a larger rise than the 1.58 deg. step from 1900-19 to 1920-39, its nearest competitor in the plot. But by definition an acceleration means a faster rate in one time interval compared with that in the preceding time interval. The only clear-cut case of acceleration in the air-temperature plot is the 1.58 deg. step circa 1920 following the preceding rise of 0.94 deg. circa 1900, which of course was at a time when any man-made warming was supposed to be relatively ineffective compared with the present time. The step preceding the recent 1.94 deg. increment was in fact a decline, so you might call it an acceleration in the sense of the reversal at the top of a ballistic trajectory, but that too would be pedantic. The claim of the man-made global warming hypothesis is uni-directional: “warmer and warmer, faster and faster”. To verify the acceleration with the Greenland data used here will mean waiting till 2039 and recording a big increment circa 2020. Test unfinished. That glimpse of the pre-industrial Medieval Warm Period, when European immigrants first settled in Greenland, re-confirms that there’s nothing unusual about any recent temperature increase. What exactly is the scary new man-made global warming supposed to have done in Greenland? A postscript on the past 100 years in this comment from PaulM on 7 May, important enough to import into the story. (Thanks, Paul). Vinther, B.M., et al., 2010, Quaternary Science Reviews 29, 522-538. This entry was posted on Thursday, May 6th, 2010 at 19:10 and is filed under 3c) Falsification tests. You can follow any responses to this entry through the RSS 2.0 feed. You can leave a response, or trackback from your own site. 5 Responses to Warming of Greenland? “Greenland Ice Sheet Surface Air Temperature Variability: 1840–2007”, Journal of Climate 2009; 22: 4029-4049, by Jason Box and colleagues. I don’t recall where I read it, by I remember a paper on CO2 transport through ice, which basically said that since CO2 can move (very slowly) through ice, then changes in CO2 levels will be slowly averaged out in ice cores, leaving no meaningful trend information. So whatever caused the pre-industrial climate changes, it was not CO2, unless this proxy is as useless as trees for getting historical information! I agree completely — the ice CO2 data are extremely questionable, but I didn’t want to digress into that in the Greenland story, so I just let the IPCC testify against itself. A minor cheat, I suppose. Stomata, the breathing holes in plant leaves, give a better guide to CO2 levels and they show, for example, that CO2 was at 20th Century levels in a warm spell at the end of the last ice age, and thereafter was more variable than the ice results suggest. Another complication is that I think CO2 follows temperature rather than the other way around. But either way, any link between CO2 variations and temperature during the past 10,000 years is only sketchy. Ice on Greenland, and Antarctic; is not as old as they think. The thermal heat on both places melts up to 2m of ice every year. That is not included in their calculation. Yes, there is very cold; but white ice is full of air = perfect insulator. Insulates the thermal heat from the unlimited coldness in the air – thermal heat is eating the ice from below, day and night, summer and winter. Therefore, by freeze-drying the moisture from the air – the deficit must be replenished; otherwise ice decreases without any warming. . Actually warmer water produces extra raw material for extra ice. They are back to front on both theories.